Anthony Manzo | The Chamber Music Society of Lincoln Center. Anthony Manzo is a sought-after chamber musician who feels at home across the wide range of classical music, whether out front as a soloist, or providing the foundation within an orchestra, exploring on historic instruments, or collaborating in his first love—chamber music. He performs regularly at noted venues including Lincoln Center and the Spoleto Festival in Charleston, South Carolina. 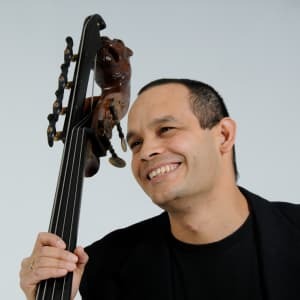 He also serves as the solo bassist of San Francisco’s New Century Chamber Orchestra, and is a regular guest with the National Symphony Orchestra, the Smithsonian Chamber Society, and the Baltimore Symphony when he happens to be near his home in Washington, DC. Formerly the solo bassist of the Munich Chamber Orchestra in Germany, he has also been a guest principal with Camerata Salzburg in Austria, where collaborations have included a summer residency at the Salzburg Festival, as well as two tours as double bass soloist alongside bass/baritone Thomas Quasthoff, performing Mozart's “Per questa bella mano.” He is also an active performer on period instruments, with groups including The Handel & Haydn Society of Boston (where his playing has been lauded as “endowed with beautiful and unexpected plaintiveness” by the Boston Musical Intelligencer), and Philharmonia Baroque in San Francisco. Additionally, he is a member of the double bass and chamber music faculty of the University of Maryland. Mr. Manzo performs on a double bass made around 1890 by Jerome Thibouville Lamy in Paris (which now has a removable neck for travel! ).